In our previous article we have briefly outlined the Islamic synthesis. However, the synthesis of the religious and secular life achieved in Islam was a practical synthesis helpful for the progress of soul who is at the initial stages of evolution but it is not a spiritual synthesis. Every human being begins his evolution as a physical being engrossed in the needs and impulses of his body. To further his evolution, first he has to be awakened to the needs and desires of his emotional, dynamic and pragmatic being made of feeling, action, desire and achievement and allowed to satisfy them. But at the same time, to prevent these desires of his vital being from degenerating into greed, he has to be motivated to regulate his desires under some higher ethical values and induced to aspire for something greater than earthly life through religion. This is the synthesis arrived by Islam. But this is not the highest synthesis nor is it the highest stage or aim of human development. This higher synthesis can be forged only in the spiritual consciousness beyond the traditional religious mind and the worldly or secular mentality. The first step towards this synthesis is to rise beyond our body and mind, even the highest intellectual, ethical, aesthetic and religious mind, to the consciousness of our innermost and deepest self or spirit which is either one with God or in direct conscious communion with God. If God is the divine source of our own being and the universe, and if our highest self or soul is the eternal child of God, then a human soul will never be satisfied with any earthly or heavenly paradises. The soul of man will be entirely fulfilled and satisfied only when it realizes its eternal divinity, returns or enters fully and consciously into its eternal home and lives in conscious union with its Divine Parent and Source. So, the primary emphasis of mysticism and the mystics all over the world, in the East and West, on an inner union or identity with God or eternal Reality as the highest aim of religion, is based on a sound spiritual logic. But to arrive at this spiritual aim we have to pass through a stage of renunciation, not necessarily an outer renunciation but an inner renunciation of all earthly ego and desires. The pragmatic compromise between earthly desires and religious aspiration, which was helpful and valid in the previous stage of development, is no longer sufficient in this higher stage. To realize this higher spiritual aim, three things are needed: first an uncompromising renunciation of every form of ego and desire; second an exclusive concentration on the spiritual goal; and third, an interiorisation or the ability to enter into the inner depth of our being. There can also be an outer renunciation of the world, if it helps in this inner discovery. But in most of the mystical and spiritual traditions of the world, this inner (or outer) renunciation, concentration and union with the divine did not culminate in a higher synthesis of the secular and spiritual life but a rejection or abandonment of the secular and earthly life. Here comes the importance of Sir Aurobindo’s integral vision, which has a living relevance for the future of Islam. According to Sri Aurobindo, the inner discovery of the divine or union with the inner divine is not the highest aim of human evolution. It is only the first but an indispensable step. The realization of the kingdom of God within has to flow out to create also the kingdom of God without. In other words, the spiritual conquest of the inner kingdom should manifest itself in the outer life as a spiritual conquest of the world through the god-realized human individual acting as the conscious instrument of the divine Power. This requires a clear understanding of the deeper divine truth, law and purpose of each human, earthly or secular activity, evolutionary destiny of man and earth and the fulfillment of this higher spiritual purpose of the secular life of man. Interestingly many elements of this higher spiritual synthesis are present in the traditional Islamic thought. But they are understood or interpreted in an external, outward sense, and also sometimes in a narrow sectarian spirit. For example there is in Islam this well-known concept of Jihad, to conquer the world for God. But it is interpreted in a narrow sectarian spirit as bringing the whole mankind under the sovereignty of a single religion by military or political expansion. But in a spiritual synthesis, to conquer the world for God means the spiritual guidance, leadership and conquest of the world by spiritually illumined human instruments of God who are inwardly united with the Supreme Consciousness of God and therefore have direct access to the universal Wisdom, Love and Power of God. When this happens not only in the activities of the higher mind of man like religion, art, thought, literature, and culture but also in the “lower” activities of life and action like economics, politics, business and commerce, we will be moving safely toward the conquest of the world by God. The path towards this integral ideal involves a dual jihad, an inner jihad against the forces of ego and selfish desire and division and falsehood within us and also an outer jihad against the human representatives of these dark forces like, for example Hitler, and their outer results like war, injustice, oppression, exploitation, poverty, corruption, inequality, tyranny, terrorism, sectarianism and many others. However in this higher synthesis, the central emphasis will be on finding the inner psychological and spiritual causes of these outer conflicts and maladies and rectify them at their inner roots. But at the same time, it will not flinch from any outer war or struggle against the dark forces in a spirit of saintly non-violence. For the qualities of the warrior-spirit who fights against oppression, injustice and falsehood called as Kshathria in the Indian thought, is also an aspect of the divine Power. And the development of this Kshathria force is as much needed for the integral growth and perfection of humanity as the other softer qualities of the saint and the sage. But at present, this Kshathria force in man is mostly flowing in the wrong direction by fighting among themselves and serving the ignorant and misguided self-interest, ambitions and ideals of the individual and collective ego, perpetuating war, violence and conflict in society. In the future synthesis we are contemplating, the Kshathria forces of humanity, instead of fighting among themselves on the basis of ego, has to join together to fight against and conquer the common inner and outer enemies of humanity, which stand in the way of progressive evolution of man towards its divine goal. This will be the true jihad of the future. The aim or goal of this jihad will be not the external hegemony of a single religion over the whole of humanity but the evolution of the whole humanity beyond the divisive egocentric mentality to a supramental spiritual consciousness in which the entire mankind is both inwardly and outwardly unified in the Unity-consciousness of God. Interestingly, according to Islamic thought the highest ideal of individual development or the ideal Muslim is to become “a vice-regent of God on earth” and to become an instrument of God “to implement God’s will on earth.” This is also one of the highest aims of the spiritual synthesis of Sri Aurobindo. But in the Islamic thought this means living according to the ethical and religious laws of Islam as stipulated in the Islamic scriptures, mainly the Sharia, the Islamic Law. But in Sri Aurobindo’s vision, the divine will and law has to be found not by any external authority or word but by an inner communion with the Divine within us. And this divine Will and Law is not something, which is entirely fixed, static or “eternal”. It is progressive because, the manifestation of the divine in the world is progressive. There may be some eternal and universal divine laws, which are valid for all times or for a long and major cycle of evolution. And the ultimate destiny of humanity for this cycle of human evolution might have been pre-determined by the divine will. But the actual working of these eternal verities in Time is a progressive process. As we have said already, each cycle of human evolution receives only that much of divine truth which the humanity of the age is able to understand, live and assimilate. And also the Divine may manifest from His timeless mystery new spiritual truths, which has not yet been manifested in the world. So as the human and terrestial evolution unrolls the divine will has to be and will be rediscovered and reformulated in every major evolutionary transition through new divine revelations. And in our daily life, living in an evolving and changing world, the truth of each situation, circumstance and event has to be discovered by inner intuition or inner divine guidance. So in a spiritual perspective, “To implement God’s will on earth” does not mean to follow faithfully an ethical and religious regimen formulated in the scriptures of the past. To implement God’s will on earth we must first of all know what is God’s will for the present, from moment to moment, through an inner communion with the living Presence of God, and then will it, and act upon it. But according to Sri Aurobindo, even this is not enough to become a perfect instrument of God. To become a perfect “Vice regent of God” on earth, our whole being, our body, life, mind and soul have to be liberated from all human limitation and become a flawless instrument of the divine Power. This rapid spiritual awakening may come either through a direct inner action of the Spirit on the consciousness of the masses or the instrumentation of enlightened and inspired leadership or most probably through a combination of both the methods. Here comes the crucial role of leadership, Enlightened leadership, awakened to the spiritual future of humanity can be a great help in steering and accelerating the evolution of large mass of people to their spiritual destiny¾through education, living example and creating the right environment in which both the individual and the community can grow freely towards their highest and integral potential. In the past, religions and civilizations, especially the Hebrew and the Islamic, relied heavily on a fixed and external law to regulate the individual and communal life. But in the future the emphasis will shift more and more from Law to Liberty, from a fixed external law to an inner and outer liberty to grow through a process of experimental and experiential learning. There is another aspect of this higher synthesis, which has implications for the future of Islam. The inward turn of mysticism or spirituality is normally associated with meditation or contemplation. Some people believe that higher spirituality or mysticism which aspires for a direct inner communion with the Divine, will remain always as an ēlite pursuit of a few spirituality gifted souls who have the capacity for deep interior meditation or contemplation or prayer. The majority of masses, who don’t have this inward turn or capacity and who live in their externalized surface being, cannot go beyond the formal piety, devotion and worship of traditional religion. But this is a wrong notion, which is based on the assumption that interior meditation is the only method for inner spiritual progress. Here comes the importance of the yoga of works or karma yoga of Indian spiritual tradition. This school of yoga shows a path by which even those who live predominantly in their externalized surface self, by taking the right spiritual attitudes to work life and action, can progress inwardly and realize inner communion with the divine in the midst of daily life, without resorting to world-shutting meditations. This philosophy and practice of karma yoga has a special relevance for the spiritual development all individual, communities or religions like Islam which are predominantly dynamic rather than contemplative and which do not reject the world but aim at a living synthesis of the higher and inner life of religion and spirituality with the outer life of work and action in the world. In fact the traditional Islamic discipline laid down in the teaching of the Prophet and the Islamic law-books is predominantly karma yoga. The central principle of this traditional Islamic Yoga is that the entire human life, not only the religious life of prayer and devotion to God but also the secular or worldly life of power, wealth, enjoyment, relationship and action have to be lived in constant remembrance and dedication to God and under the guidance of uplifting ethical values. But the Indian doctrine and practice of Karma yoga can help in bringing out and illumining the deeper, spiritual, significance of the traditional Islamic yoga and elevate its practice from the religious to the spiritual level. We will not enter into the details of Karma yoga in this article. However, the main principles of karma yoga are: first, equanimity under all circumstances, mainly for the dual strokes of life like pleasure and pain, sorrow and happiness and praise and blame; second, renunciation of the desire for the fruits of action; third, all work and action done as an offering to the Divine. However, as we have said earlier, whatever may be the path chosen, works, love or meditation, the aim of all spiritual path, and the first step towards the higher spiritual synthesis which we have discussed so far, is the liberation or perfection of the inner being and inner communion with the divine presence within us. This inner discovery is the specialty of eastern religion like Hinduism, Buddhism and Taoism. But this inner quest is not the exclusive preserve of eastern religion. There is a mystical core in every religion. In Islam it is Sufism. 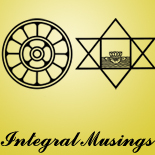 This entry was posted on April 2, 2013 by integralmusings in Islamic Civilisation & Culture.